The Wiangarie, the Seven Sisters, are significant creation beings for all of the Feathered Serpent Lore Traditions across Australia …..it metaphorically explains the prehistoric lore of the explosion of water and life on a previously barren primordial earth…..
“I want to share with you important creation lore – the Yoocum Yoocum Bootheram Lore about how aquatic and terrestrial life emerged on this planet way back in the Dreamtime…..this Bootheram metaphorically narrates the creation of life in the waters and its emergence onto land…… and the strict rules of marriage from the heavens which ensures increase, and not extinction, of all species ”…..
“It is called a “Boodharam gawari”, which means story ‘run’, or Songline, with all of the associated djurebil, sacred sites, connected across the landscape, and in the sky”…..
“Men and Women share the same sky when teaching Lore, and so the same creation spirits, or Sky Ancestors, appear again and again throughout the Bootheram’s….but all appear in the sky together and the stars can be read like a story board…making all Bootheram lore uncorruptible ”…. “The Wiangaree are ancient Water Lubra Spirits whose ongoing celestial dance creates our sacred Skinlore Kinship cycles…. The Wiangaree brought to the surface, and from the heavens, the gift of sacred water – unifying ALL LIFE on this planet……every species…. 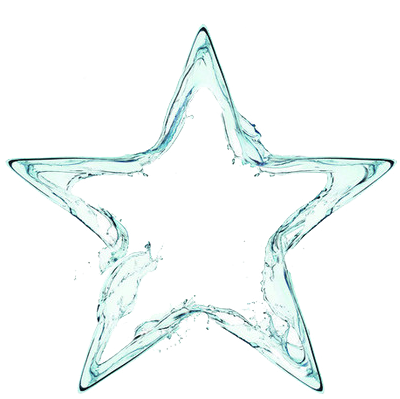 It is the Women’s Water Lore which we still use today – which can be found all over the planet ……its tracked using a galactic pentagram , guarded by the two spirit dogs, Innernoogun and Burranjarnee, whose celestial bodies are hidden in plain sight around the constellation of Orion, with their terrestrial bodies forming the landscape of the Wollumbin Caldera Terra-henge – in the Ngarakbul ancestral estate of the most eastern Volcano of the Australian continent …. The Whailibul [Bandjalang] Clan are one of the marriage clans of the Ngarakbul and Githabul…. the “ Wiangaree Boodharam gawari” travels through the waters – up the ancient Clarence River to meet with the other marriage clans……Wayal Balun is what they call the ”river of the Milkyway”, which is mirrored onto the land as the mighty Balun …the colonialists renamed the Clarence “…..
Journeying through the Jurassic forests of the Wollumbin Caldera came the Rainbow Serpent – Warrazum ……. that’s how the Warrazumbil Wilderness got its name.…. 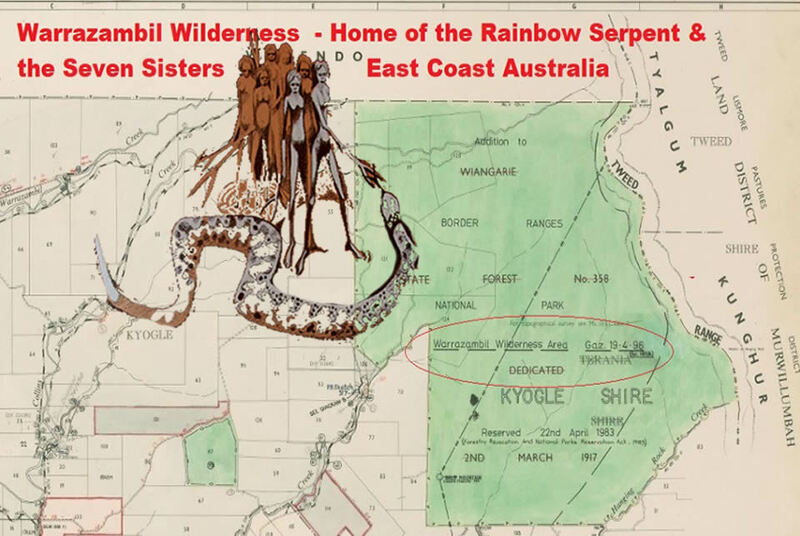 It is the abode of the Rainbow Serpent Matrisitic Lore …..from this location it travels west to align with the djurebil of the Githabul ancestral estate, of the Grandfather Spirit ”…. “Ngarakbul Lore Woman and invasion survivor Charlotte Brown, inherited the custodianship of Yar Birrain – Mount Warning and the Ngarakbul Lore from her Great Grandfather King Brown during the time of colonial invasion”…..
“In order for the Skinlore, Kinship and Starlore Bootheram’s of the Rainbow Serpent and Nguthungulli, to survive the genocide and invasion process, the lore had to go underground…but it was never lost”……. “The Origine’ people didn’t come here from another place ….they were made here, by Nguthungulli – he is the creator…and he made the first people out of the earth” …..
Today’s corporate government is altering the ancestral matristic lore of the Rainbow Serpent and exclusively endorsing Patriarchal aboriginal Lands Council systems …. “Muldoom was a fully initiated ‘marugun’- which means a Senior Lore Man, and he was from the Bandjalang Clan [Whailubul] of Dirrawong – Evans Head … He married ‘Black Mary’ Brown, the eldest of the four ‘Brown’ daughters of the Ngarakbul clan”…. “Muldoom and Mary’s union was the last full tribal marriage to take place on Dirrawong – Goanna Headland”…..
“Ngarakbul, Githabul and Whailibul [Bandjalang] are three of the twelve clan marriage triangles of the eight skins of the Feathered Serpent traditions…and each with their own sacred ‘Bul” – Tree Totems”…. “The Wiangaree Boodharam gawari governs all of the kinship skinlore and it comes directly from the Star Ancestors…..it is written in the sky and onto the ancestral landscapes…it is very sacred to the Origine’ people…..the stars align at certain time every year and ignite our djurebil here on the earths surface….refreshing the Bootheram…increasing life and ensuring survival”. “All of the creation Bootheram is told in metaphor… Bootheram of the journeys and adventures of our Sky Ancestors are describing significant earth events…geological, hydrological, evolutionary, atmospheric, galactic events”…..
“The Wollumbin Caldera is the ceremonial and ritual forum of the Skinlore Starlore cycles…. people would come here to ritually celebrate since time immemorial at the Pinnacle Coowarragum Stone complex…..This sacred djurebil ‘record’s the galactic time cycles of our galaxy”…..
“Time and space govern all of life and the sacred marriage lore’s, are mythologized by the Sky Ancestors, Leho and Leva ….the handsome Bullughan and beautiful Ggawungan….. Sky ancestor spirits”…..
“All Starlore Bootheram Skinlore/Kinships commence on the east coast of Australia in the ancestral lands of the Bird Tribes……It starts here because the stars rise above the landscape from the east FIRST …and travel HOME to the west …to the oldest terrestrial land on the planet…The West Kimberley – the first land to emerge from the primordial sea in the Alcheringa – 3,600million years ago”…. “The mighty Clarence River – Wayal, Balun which in Ngarakbul Githabul dialect means Milkyway, flows from the Great Artesian Basin – the ancient freshwater seas of the Rainbow Serpent creation….the Yoocum Yoocum frontier was once a vast area bound by the ancient River, and their creation Bootheram uses all the stars as the story board to tell of creation”…..
“The Wiangaree Boodharam gawari, relates how seven beautiful spirit women descend to earth at Dirrawong, Goanna Headland in the ancestral lands of the Whailibul –Bandjalang Clan, and journey up into the headwaters of the primordial Clarence River into Ngarakbul and Githabul ancestral estates”…. “Wiangaree Boodharam gawari is the lore of the journey of the Rainbow Serpent and the Seven sisters – as they dig the freshwater springs and seed the waters with life – it begins way back in the alcheringa – the beginning of the Dreamtime….the Cretaceous epoch ”…. “After the cretaceous creation epoch, the Seven Sisters send the world to sleep, wrapped in a blanket of ice and return to the to ‘Sky River’ to look down upon creation with the other Sky Ancestors …. Millennia passes and one day they looked down and saw life on earth awakening and blossoming…..They sort to return to earth to satisfy their curiosity”…..
“These girls were all very clever and they possessed ritual digging sticks, ‘ganay’……. inside their sticks they had secret charms….Elemental forces which they could use to protect themselves from their enemies”……..
“Each day on earth the Wiangaree went hunting…. seeking water snake and gathering yam’s in the bush, and they carried their yam sticks with them”……. “As they hunted they encountered the group of beautiful women travelling together……. Kurrumbil thought them to be initiates engaged on their ritual quests into womanhood, so he dared not approach them….if the Wuyan, cleverman, Burrigan, knew he saw the girls, there would be trouble”…..
“But that night he dreamed of the women, and day after day he and his two dogs followed them, watching from the cover of the forest…. and each day he felt his desire for the girls growing…. wanting them for his wives…….Kurrumbil knew it would be dangerous and difficult to catch one of these women…so he resolved to track them and wait for his chance”…. Kurrumbil laughed at them…and carried them both off to his mountain camp at the base of a great pine tree….suddenly, using the powers of their magical sticks, the two sisters summoned the waters of the creek in the camp, ‘Kurrumbyn’, to rise up and wash Kurrumbil down the mountain and out the mouth of the Ngarakbul River – the Tweed……They then left the mountain and traveled back to their sisters” …. “Kurrumbil however would not be deterred so easily….. he was obsessed with the beautiful young girls…He decided to pursue them with even more stealth”…. “One day, having again been hunting in the mountains with his dogs, he came upon the Wiangaree when the they had stopped to bathe in the cool waters of the river – Wayal-Balun…… the women had left their magical yam sticks leaning against a tree growing beside the river while they swam”…. “As the Wiangaree laughed and played in the water Kurrumbil crept to the base of the tree and stole the magic digging sticks and hid them along the rivers banks ……but he kept the ‘ganay’ of the youngest sister…She was the one he desired most”…. 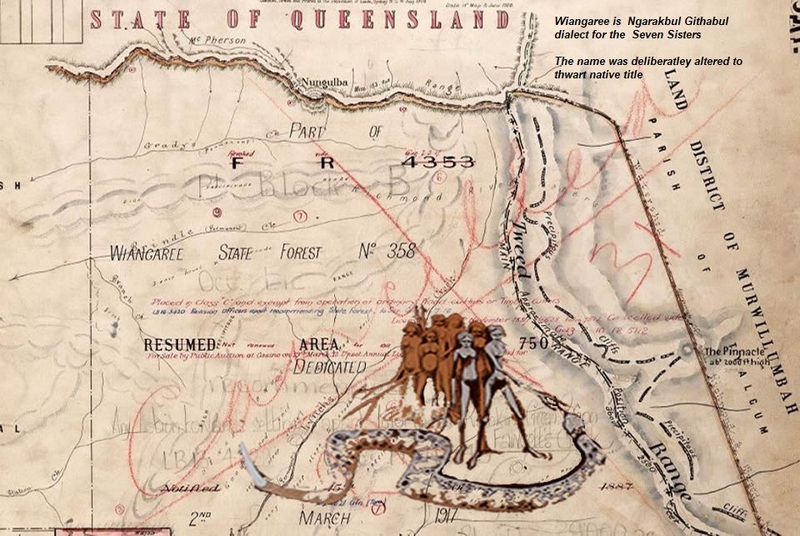 “When the Wiangaree returned from bathing they discovered the theft and began to search along the rivers banks…..It was late afternoon before they recovered them, but there was still only six of the ‘ganay’…. “Kurrumbil, watching from the forest, saw his chance…..He waited until she came close then crept behind her and captured the young girl…She of course did not have her yam stick with her so he was able to carry her off to his own camp at the base of the great pine tree”…..
“One of the eldest suggested they should go away to the west where they knew the winter lived and send back long nights of frost and freezing winds to punish Kurrumbil…… ’bagaywena’- to darken the earth and freeze him” …. “It was agreed to journey far into the west…..they found the winter and sent back frost and exceptionally severe weather to the camp where Kurrumbil and the girl were living …so cold that Kurrumbil almost died”…. “The Wiangaree then decided that they should not cause any more hardship to the earth by the severe cold, so they decided to travel far into the east in search of warmth and summer….At Winter solstice they appeared in the east, traveling with the Whale Spirits ….and brought with them the warm rays of mother sun to melt the frost and ice”…. “After the departure of the Wiangaree, Kurumbil was lonely….He looked far and wide for another wife, this time determined to comply with the marriage rules of his people…… He found a young woman who belonged to the Kooran section, a beautiful young girl whom he wished to marry…….. Unfortunately, she was already married to a man named Bullabogabun, a great warrior” …..
“Again Kurrumbil broke Lore …..He succeeded in seducing the young wife and she agreed to run away with him”…..
“Kurrumbil and the young wife travelled along the coast to make a new camp away from her husband…..they arrived at Kurrumbin – which mean’s Kurrum’s camp …a significant place on the Gold Coast now known as Currumbin in Ngarakbul country [ Ngar-ahn-g-bal]”………..
“When Bullabogabun discovered that his wife had eloped he followed in a great fury……arriving at the camp and then chasing the lovers through the landscape”……. 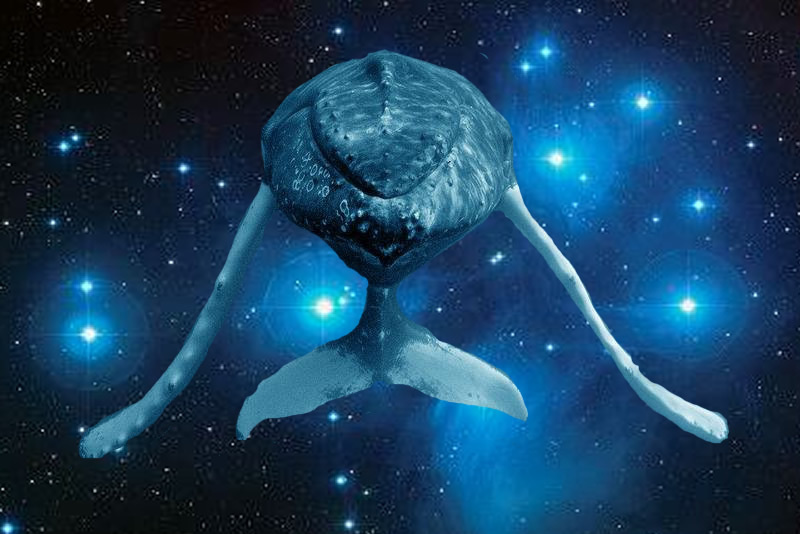 “Every year the Wiangaree reappear…rising from the east in the ocean off Ngarakbul ancestral estate – always on winter solstice– always travelling with the whale spirits ‘wardham’….. together they bring with them the skinlore and of promise of pleasant warm weather returning to those who uphold the lore…. After which they gradually disappear towards the west…… This reminds us they are preparing to send the cold and winter to warn the Tribes men not to carry off a woman of the wrong kin, but to always choose proper wives as the Skinlore says they should”…. Previous The Sacred Spring – Birth of a Continent in Aboriginal Lore.